I’m a little late on this one. Tim and I are closing on a new house tomorrow, so we’ve both been busy trying to get everything together for that. In spite of the madness, I wanted to post a pic and let you guys know that I’m feeling pretty good this week (I even slept a couple of nights, woo!). 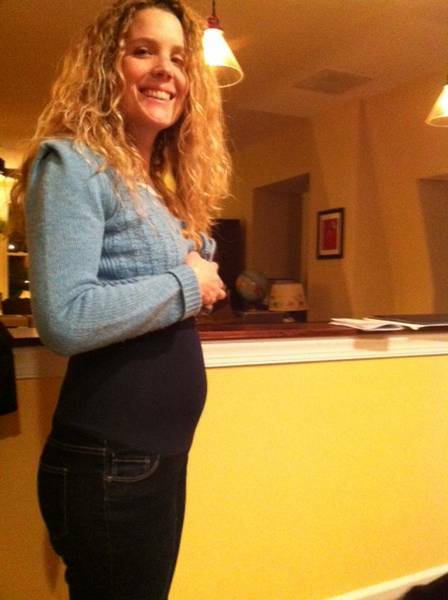 I think the bump looks a little bigger, right? Again, photo quality not so great. But you get the idea. My friend told me that it looks like I’m carrying a boy. What do you guys think? Is it too early to tell? Many of you asked if I’m going to find out the gender and the answer to that question is a resounding HELL YES! I can’t imagine not knowing as soon as possible. I feel like knowing will help me bond with the little one. If Baby is cooperative, we should find out at our ultrasound on March 19th. I can’t wait! It seems unbearably far away right now. I will, of course, keep you all posted. So here I sit, 16 weeks pregnant. Hot damn! Still seems crazy to me. Thank you all for your congrats! I think I’m going to post weekly (or maybe bi-weekly) updates about my pregnancy journey on here. If this is boring to any of you lovely readers (and I totally understand if it is because a few years ago weekly pregnancy updates would’ve made me want to shoot myself in the head), I promise I won’t be offended if you skip them. So. Effing. Tired. Despite having insomnia this entire pregnancy, I was not really tired my first trimester. Now? Forget about it. I can barely keep my eyes open. 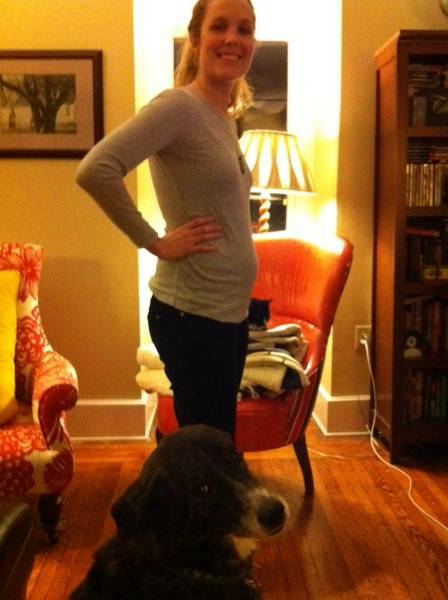 I thought the second trimester was supposed to be a time of blissful energy and pregnancy glow? Not so much. The nausea, however, is gone (hooray) and I am joyfully back to eating wasabi peas and siracha sauce. Strangely, though, I have very little appetite. I think that’s because I’ve been making sure to eat every two to three hours, which leads me to another symptom: dizziness. I almost passed out in my work cafeteria last week and ended up stumbling to a table and sitting there with my head down for five minutes. The place was packed and my office is way to cool for school, so I got some interesting looks. It was pretty hilarious, actually. But anyway, after that incident, I decided not to let my blood sugar get low ever again. The other two new symptoms are round ligament pain and shortness of breath. Pretty much walking anywhere makes makes me winded. And climbing the stairs? Whew! Excuse the piss-poor photo quality, but here you can see I have the ever-so-slightest of bumps. Yay! So I guess I should, like, start planning or something? Until now I’ve been taking this pregnancy strictly day by day. It was really the only way I could deal with the anxiety. But now I’m thinking that it’s time to start looking ahead. There’s going to be a baby in my house in six months, so I should probably start planning for its arrival, right? Here’s where I want to ask for help from you guys. Please recommend any good pregnancy products I might need, products to get for baby, things I should start doing now (looking into daycares? ), and ways I can prepare for baby that I might not be thinking about. I don’t know, just anything you think might be helpful for me to think about in the next few months! Any thoughts would be much appreciated. I did break down and buy some maternity pants recently, and last week I bought my first item for baby–a set of two Phillies pacifiers! Both of these things made me feel like I was taking a step away from anxiety and a step towards joy. Wanna know why this blog has been so infrequent and lackluster lately? It’s because I am a horrible liar. Always have been. The truth is, I am 14 weeks pregnant! I didn’t feel comfortable sharing the news until we heard a heartbeat (which we did on Wednesday: amazing! ), hence the slew of random, totally-non-fertility-related blog posts. It definitely felt weird not to share it with you guys right away, since I’ve shared every step with you up until this point. But holy crap, can you believe it? I kind of still can’t. Every day I am amazed that I got this lucky. Everything I’ve been wishing and praying for: granted. I feel elated and blessed and terrified all at once. Since I posted about my last visit with the doctor, you’re probably wondering how the pregnancy happened and if I went the fertility treatment route. The crazy thing is, when I wrote that post, I was actually pregnant but didn’t know it yet. In an amazing turn of events, I never had to make a decision about whether or not to try fertility treatments. The decision was made for me by the tiny baby I am now carrying. I am still in disbelief that it turned out this way. And I am grateful every single day. Thank you all so much for your support on my babymaking journey. I appreciate it more than I could ever say. Seriously, you guys are awesome. I hope you will stick with me on the next phase of my story. And if you are still in the babymaking trenches, please know that I understand if you want to step away from this blog for a while. But also please know that I am thinking about you and caring for you and hurting with you and most of all, hoping for you. Fervently. Even if you stop reading, I will not stop praying for you and fighting for you.